This pierogi lasagna recipe is the perfect combination of my family. I have been eating Pierogis for as long as I can remember even without any direct bloodline to Eastern Europe. Hmmm….I am not sure who was making them, but I can remember eating them a lot as a kid. I grew up in NY with 100% Italian parents, so I cannot imagine my mom making them. She made like 5 dishes and I don’t recall pierogis being one of them. Maybe it was my Polish Aunt? I need to ask next time we have a family gathering! I always get great ideas and information when the family gets together. Now, that I have married a man of Eastern European origins, I make Pierogis more often! Not just the frozen kind! I decided to make a Pierogi Lasagna Recipe that brings in both side of my daughter’s family heritage. My daughter is Italian and part Slovakian and Polish from my husband’s side. If you are unfamiliar with Pierogi, they are dumplings from Eastern Europe. They are little pockets made of unleavened dough wrapped around a savory or sweet filling. They are usually cooked in boiling water, but I’ve had success cooking the frozen ones (pre-cooked) in a frying pan. Pierogis are typically filled with potato, but I have heard that they are sometimes stuffed with sauerkraut, ground meat, mushroom, cheese, and fruits. Recipe ideas to come!! They are served with toppings like melted butter, sour cream or fried onion. MMMM that all sounds so fantastic! Looking for more Eastern European inspired recipes, try this Beet Root Soup Recipe with Coconut Drizzle. 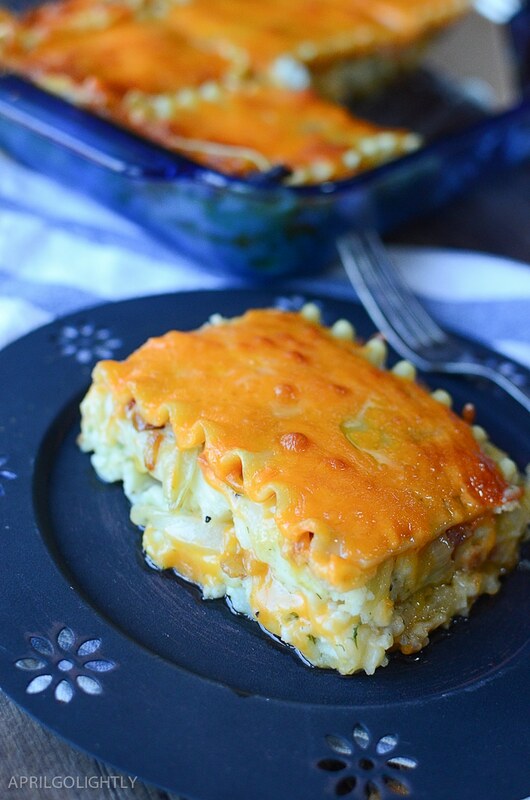 If you are looking for a simple Italian one pan lasagna recipe, try out this one out. Preheat oven to 350F. Grease a 9 x 7 casserole dish. This awesome baking dish is listed on my ultimate kitchen tool and equipment buying guide blog post. Boil peeled and sliced potatoes until tender. Drain and add butter, milk, dill, garlic powder, salt and pepper. Cover the mashed potato mixture and set aside. Note: If you have leftover mashed potatoes that works too. In a frying pan, on medium heat, sauté bacon and onions together with a dash of pepper until soft and translucent. Does this sound fantastic? I am getting hungry as I type this! Boil the cooked Lasagna Noodles until cooked al dente (mainly you should cook noodles according to package directions) or buy the oven ready lasagna noodles. To begin assembly, lay two lasagna sheets down on the bottom of the dish. If they are too long, cut to fit and reserve the extra bits of the noodle. Next, cover the lasagna noodles with ½ of the potato mixture. Lay another 2 lasagna sheets down. Use the extra bits of the previous noodles to cover any bare spots. Cover with the other ½ of the potato mixture. Next, cover the potato mixture with the other 1/2 of the bacon/onion mixture. Cover the bacon/onion mixture with another 1/3 of the cheese. Lay the final 2 lasagna sheets down again, using the previous bits of noodles to fill in any gaps. Sprinkle remaining cheese on the top. Bake in the oven for approximately 30 minutes or until all the cheese is melted and the casserole is heated through. You can broil the casserole for the last minute or so if the cheese has not browned on top (if that’s the way you’d like it). Remove from oven and let sit for approximately 10 minutes before serving. Serve with topping options on the side or add the sour cream and chopped chives topping on yourself. You can also give your guests and family options of toppings like Fried Onion. Grease a 9 x 7 casserole dish. Boil peeled and sliced potatoes until tender. Drain and add butter, milk, dill, garlic powder, salt and pepper. Cover and set aside. In a fry pan, on medium heat, sauté bacon and onions together with a dash of pepper until soft and translucent. Boil the Lasagna Noodles until cooked al dente or buy the oven ready kind. Cover with ½ of the potato mixture. Lay another 2 lasagna sheets down. Use the extra bits of the previous noodles to cover any bare spots. Lay the final 2 lasagna sheets down again, using the previous bits of noodles to fill in any gaps. Sprinkle remaining cheese on the top. Bake in the oven for approximately 30 minute or until all the cheese is melted and the casserole is heated through. You can broil the casserole for the last minute or so if the cheese has not browned on top (if that’s the way you’d like it). Remove from oven and let sit for approximately 10 minutes before serving. Serve with topping options on the side or add the sour cream and chopped chives topping on yourself. You can also give your guests and family options of toppings like Fried Onion. This Chicken with Roasted Red Pepper Sauce is delicious and also Keto diet compliant. Try this Balsamic Chicken Bake for a yummy way to bag chicken and veggies. Make your own pizza with this mushroom and spinach almond flour pizza. We love pierogi, and this sounds delish! Thanks for sharing at Merry Monday! This looks so tasty! I love Pierogis and lasagna! Count me in!